Following a great response to our initial Introduction to MindGenius webinars, we are now pleased to announce more details of our upcoming webinar programme. Consultants who use MindGenius cover a wide variety of specialities but all have one thing in common: they believe MindGenius can help them improve the experience they offer their customers and this webinar will show how the MindGenius approach can be applied in a consultancy setting. Read the story of a consultant who uses MindGenius in conjunction with WebEx to deliver online mind mapping to slash the time and cost of collaborative problem solving. More Webinars will be announced next month, are there any topics you would like to see us cover? SWOT Analysis - So What? SWOT analysis is a useful tool for the development and evaluation of strategy and action plans. The acronym - SWOT - stands for: Strengths; Weaknesses; Opportunities; Threats. The analysis is usually applied within a specific context, from the viewpoint of; an organisation or company; a product; a project; an individual. The time to use it is when a goal or objective has been set and you are defining the strategy or plan to achieve it. Threats: external factors, outside of your control which present risk to the achievement of the goal, identify their likelihood and possible impact. Time frames - now and the future. 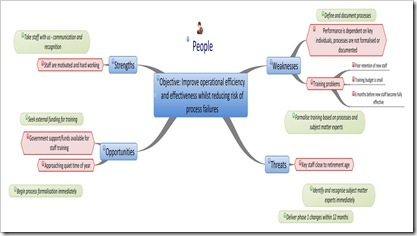 SWOT analysis provides a model for you to consider these dimensions together, as illustrated by the figure above. The key thing to get across is that the analysis - listing the factors against each of the SWOT elements - is only part of the process. Review the ideas captured - what strategies come to mind? Ask the question, "How well does this help with achievement of the goal?" Select the preferred strategy, assign ownership and start to act. One way that Steve practices SWOT Analysis is by utilizing MindGenius mind mapping software. Do you have any SWOT Analysis tips to share? A project retrospective is a facilitated session held either at the end of a project’s lifecycle or at various intervals throughout. Also known as lessons learned or project close outs, retrospectives are held to identify and analyse what went well and what did not. Retrospectives are utilised to learn from past mistakes and to take these lessons forward into the next phase of the project. Vincent Pickering, a Software Project Manager at Gael Ltd, believes the objective of a Retrospective is to learn and adapt. Vincent is responsible for planning and the day-to-day needs of projects assigned to him. He oversees 2- 3 projects at a time which can vary in team size from 3 to 20 software developers. Vincent says that they apply the Agile SCRUM project delivery method for each development assignment. Vincent is an advocate for retrospectives to be performed throughout a project. He says that not only is there a final project retrospective session at the close of the development project but a retrospective meeting is held every two weeks, at the conclusion of each sprint. A sprint is a time period, around 2 weeks, in which development takes place on a set of backlog items that the Team has prioritised. There are issues with running a retrospective every 2 weeks. Vincent believes that these sessions can become rather stale leading to sessions seeming repetitive thus not producing any valuable insight or relevant actions. Focusing on techniques to keep the retrospectives fresh such as De Bono’s six thinking hats, 5 Whys and SWOT analysis have brought a certain amount of success to him. Switching locations and swapping facilitators also brings an element of freshness to the retrospectives. 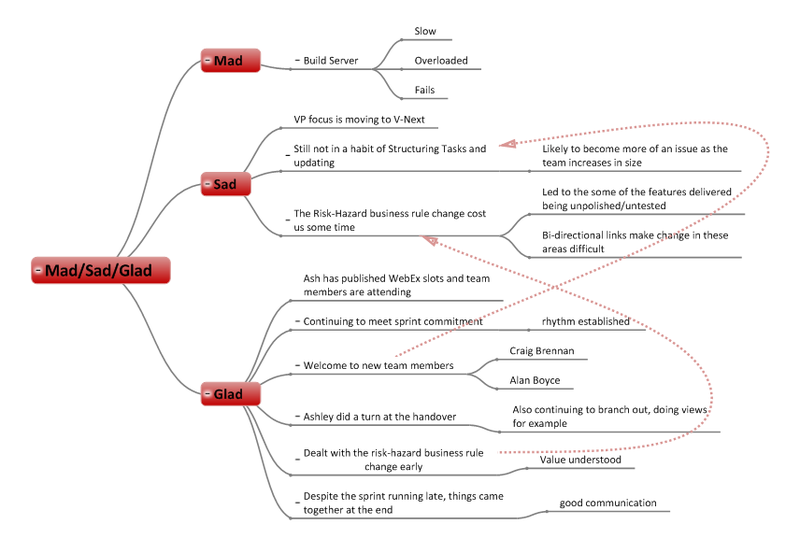 One specific technique that is a personal favourite of Vincent’s is the mad/sad/glad framework. Every two weeks, once a sprint is completed, he will gather all project participants into a room and try to entice information out of each individual concerning the delivery of the sprint. He kicks off by starting with the positive, throwing a wide question “OK, what went well, what’s the good stuff?” Classic replies are that they met their deadlines, worked through a problem well, or that someone new had joined the team. Generally there will be people who are shy and might need a little prompting to get something out of them. Vincent has a ready set of prompts created for such situations to help encourage individuals to participate. Fig 1. Retrospective Brainstorming session. ﻿ Vincent believes people are happier communicating negatives rather than positives. Most people have something that annoyed them ‘sad’ and if anyone is really annoyed/angry then they usually don’t have to be prompted to speak up. Typical sadness is that “I didn’t have the time to fix that annoying bug’ or the build server played up again. Hopefully actual anger, ‘mad,’ will already have been abated before the meeting, it would not be wise to go ahead with a meeting where people just want to throw rocks at one another. ‘mad’ answers would be ‘the build server is so unreliable it cost us two days of development and that’s why we missed our deadline’. ﻿﻿From these Retrospective sessions, Vincent will be able to identify what areas should be enhanced, whether a new process should be introduced or whether any specific individual has performed well. Once the group has reached a common agreement, actions are derived from the session (usually round the sad/mads) and volunteered or assigned out. This is important since if you don’t try and fix what went wrong you aren’t adapting but just getting things off your chest. The next retrospective session will contain a review of actions allocated in the previous session. A retrospective is an invaluable tool to help learn and adapt. 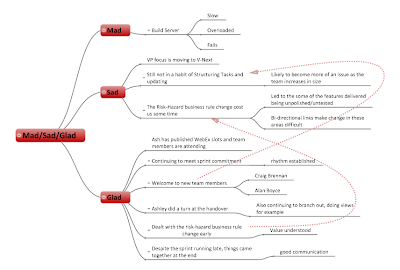 Vincent has successfully used the mad/sad/glad framework to help keep the sessions fresh and promote individual thinking amongst the group. Using this framework in conjunction with MindGenius allowed Vincent to unearth all relevant information from the participants and keep the meeting streamlined. From the completed map, participants are able to recognize the lessons learned and have a clear view of tasks to be implemented in the next phase of the project.